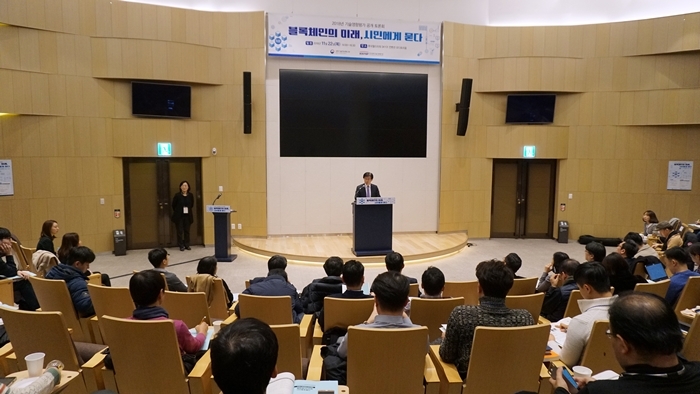 Ministry of Science and ICT (MSIT) and KISTEP held ‘Blockchain Technology Assessment Open Forum’ on November 22nd (Thu) at the auditorium of Lotte World Tower. Every year Ministry of Science and ICT (MSIT) and KISTEP choose a new future technology which has a great ripple effect on technology, economy, and society, and conduct a technology assessment to evaluate impacts on overall society in advance, and to provide the counterplan. The forum was held to collect public opinions on ‘2018 Technology Assessment Result (draft)’ prepared by ‘Committee of Technology Assessment’ with various experts and ‘Public Forum’ with general public. 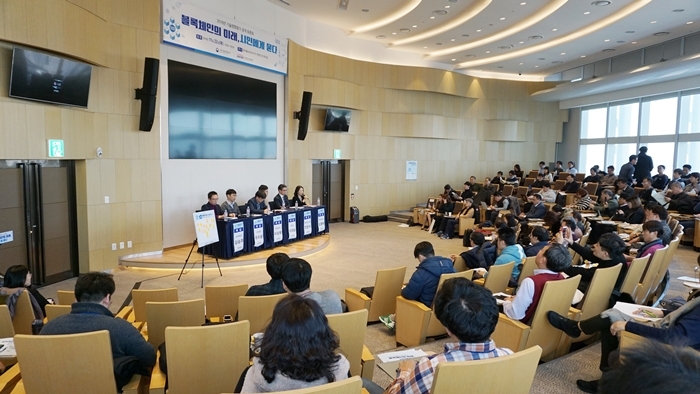 The forum consists of ▲Blockchain technology lecture by member of Technology Assessment, Seung-Joo Kim (Professor, Graduate school of Information Security, Korea University), ▲presentation of ‘Assessment Result (draft)’ by chairman of Technology Assessment, Sangwook Yi (Professor, Hanyang University), ▲and panel discussion on ripple effects and the counterplan of Blockchain Technology (Chairman Sangwook Yi (Professor), Panel Seung-Joo Kim (Professor, Graduate school of Information Security, Korea University), Soo-woong Yu (Representative of the Public Forum), Yeolmae Kim (Senior Analyst, Hanwha Investment & Securities Co., Ltd.), Chan-sik Ahn (Lawyer, HMP LAW), and Daeseung Lee (COO, OWDIN)). Meanwhile, the content of discussions on this day will be reflected in ‘2018 Technology Assessment Result (draft),’ and will be reported to Presidential Committee of Presidential Advisory Council for Science and Technology. After issuing technology assessment results in the form of easily readable booklet, it will be distributed to agencies of various levels early next year, and will be shared on Ministry website of Science and ICT (MSIT).